ASHBURN, Va. – June 4, 2018 -- Curtiss-Wright’s Defense Solutions division today announced a significant performance breakthrough in the design of compute intensive High Performance Embedded Computing (HPEC) systems for Intelligence, Surveillance and Reconnaissance (ISR) applications based on the Wind River® VxWorks® real-time operating system (RTOS). 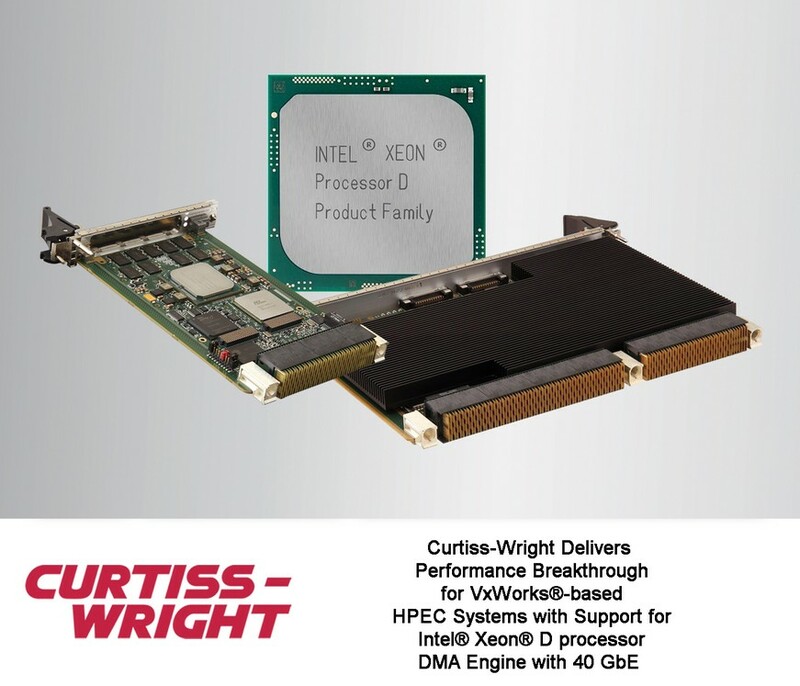 New software drivers, included in Curtiss-Wright’s latest Board Support Package (BSP) for use with its Intel® Xeon® D processor-based CHAMP-XD1 3U OpenVPX™ and CHAMP-XD2 6U OpenVPX DSP modules, uniquely enable VxWorks® to access the Intel Xeon D processor’s QuickData Technology DMA engine, freeing the multi-core processor from devoting critical resources to communications handling. In addition, the new VxWorks BSP enables the industry’s first support for Mellanox® Ethernet Controllers, previously available only in Linux operating environments. 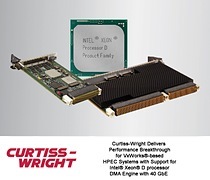 Enabling unprecedented performance, this solution delivers 40 Gigabit Ethernet (GbE) on Curtiss-Wright’s Fabric40™ CHAMP-XDx modules rated at ~37 Gbps, near line-rate. For designers of HPEC systems, the features of this new BSP represent a true industry milestone. Now, for the first time, HPEC system designers that require the deterministic, hard real-time attributes of VxWorks can take full advantage of the Intel Xeon D processor architecture for multi-core/multi-board HPEC systems for designers of ISR applications. Additionally the VxWorks support for the Intel Xeon D processor’s QuickData Technology DMA engine, which was previously limited only to Linux users, is now provided in the new Curtiss-Wright VxWorks BSP. To reduce program risk, improve affordability, and speed time to deployment, Curtiss-Wright offers system integrators a range of development to deployment system options. This approach enables the system integrator to match the equivalent development system they need to the appropriate stage of their program, while enabling application transfer between the stages with minimal effort. Curtiss-Wright Corporation is a global innovative company that delivers highly engineered, critical function products and services to the commercial, industrial, defense and energy markets. Building on the heritage of Glenn Curtiss and the Wright brothers, Curtiss-Wright has a long tradition of providing reliable solutions through trusted customer relationships. The company employs approximately 8,600 people worldwide. For more information, visit www.curtisswright.com. Note: Trademarks are property of their respective owners.